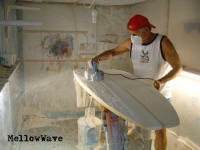 How a MellowWave surfboard is made, we take you through the board building process. 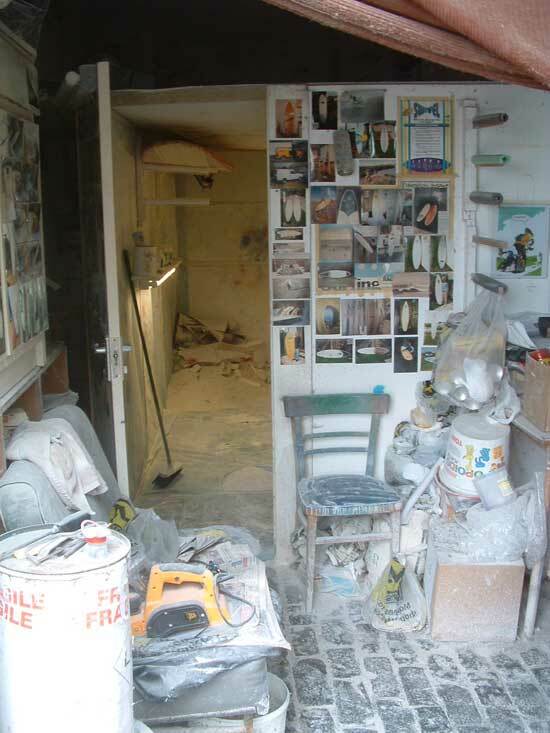 The entrance looking in to the shaping bay where MellowWave surfboards are hand crafted by Steve James. 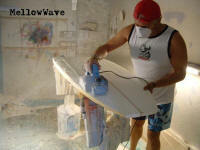 This is where you would pick your board up from, Steve will show you around the bay and explain how your board was made (if your interested of course) you should leave with a real understanding of your new MellowWave surfboard. 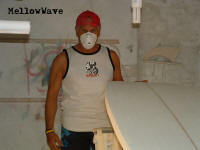 This page will take you from a rough surfboard blank to a shaped board ready for glassing. We start by power planing the blank down to the required thickness. You may notice how the lights are angled to shine across the blank, this is so the shaper can see any shadows which will help get the board smooth. Steve is now marking out the template line using the dimensions required by the customer, as you can see the order sheet is on the blank! We have many templates and can do all shapes. Using a surfform Steve can clean up the edge nice and even with no bumps. � Since 2002 mellowwave.co.uk, All Rights Reserved.